Robert De Niro as Jack and Edward Norton as Stone. John Curran (“The Painted Veil” 2006) directs a layered, compelling film centering on four main characters’ secrets, sins and surprisingly, delves deep into the topic of faith. 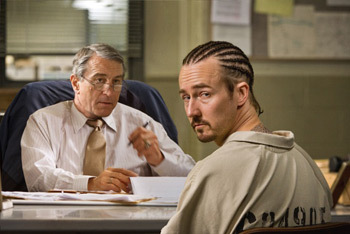 Edward Norton (Stone) stars as a cornrowed, convicted arsonist who’s served eight hard years in prison and hopes to convince Robert DeNiro (Frank Mabry) a Detroit corrections officer, that he’s been rehabilitated. Enter Mila Jovovich, Stone’s sultry, amoral wife, Lucetta, who ultimately seduces Frank. Throw into the mix the bible reading, Mrs. Mabry of 47 years of marriage, played amazingly by Frances Conroy and you’ve got a brutal, dark drama that has many unexpected twists and turns. Make no mistake this is a prison film, a genre that goes hand to hand with violence. Be forewarned, there is a bloody knife stabbing that’s pretty hard to simply ignore. If you can get past that, then you’re in for a mystery thriller, as the viewer really has no idea where this film is going and where it will end. The performance by Ed Norton is mesmerizing and you’ll be hard pressed to take your eyes off of him. He’s been in the ‘Big House’ so long that he’s adapted the lingo and physical appearance of a hard con. Oh, and is he ever a slick conniver. The film opens with a much younger Mr. and Mrs. Jack Mabry. An outwardly timid Madylyn tells Jack that she wants to leave him. He immediately reacts and commits a bizarre gesture that sets the dark tone for the entire film. We also notice a bumble bee that is trapped in the window sill of their home and is suddenly squashed by slamming the window shut, perhaps a symbolism of Madylyn’s entrapment and the trampling of her soul. We flash forward some 40 some years later to a marriage that lacks emotion and centers on routine. Each night, the couple prays before their meal, retires to the porch and while sitting in their rocking chairs they indulge in hard whiskey, possibly to numb the pain of their pitiful circumstances. Jack is about to retire from his job as a correctional officer when he meets Stone. What we know from the opening scene is that Jack appears to be a normal kind of guy, but has major flaws. Stone wants out of prison and will do just about anything to do so. He taunts Jack and talks incessantly about his wife Lucetta. “She’s a dime, a perfect ten and she’s also crazy,” Stone tells Jack. What Jack doesn’t see coming is that Lucetta and Stone plot to make sure that he’s released. From this point on, you have a fairly good idea that the film is not going to end well. And, with all the twists and turns, you’ll be on the edge of your seat as the mood is unsettling. The cast is memorable especially Ed Norton as Stone. He conversed with inmates and interviewed many to come up with the prison lingo. My favorite line, “I don’t want no beef with you, I’m a vegetarian,” is as about authentic as you can get. Bottom-line: If you’re a fan of superb acting, characters that are multi-layered and a dark compelling story, this film fits the bill.